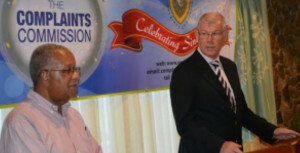 The people of the Territory have a right to know, and have to have their questions answered, His Excellency Governor Boyd McCleary remarked on 7 May as he praised the Office of the Complaints Commissioner; and thanked the staff of the unit who make it possible for the public to get the answers and redress that they seek. Last Wednesday, the Office of the Complaints Commissioner celebrated its fifth anniversary with a cocktail reception at Maria’s by the Sea. In his remarks at the event Governor McCleary said that the Office was an accountability mechanism, and noted that accountability is important to governance. “I think it is a good thing to have a sense of challenge, a sense of accountability and I am conscious that the very existence of a Complaints Commission has meant that people now have recourse in a way they didn’t have previously to address their complaints,” he said. He further stated that people have a right when they feel aggrieved to complain and that public servants should understand this fact: “I have always been a great believer in the principle of complaining. I benefitted personally from complaining and I think that I would encourage others to complain once something goes wrong. Because if you don’t complain, the things that go wrong will stay wrong,” he said. He said he could share some of the frustrations of the Complaints Commissioner, Mr. Elton Georges, who himself has complained about the non-support of Government agencies. The Governor suggested to public officers that the Commission is not a nuisance, but it’s part of their job.